Do you hear loud noises in your attic at night? Does it sound like something is crying or chattering in your chimney? Is your garbage can knocked over every morning when you wake up? If so you might have a raccoon problem. Here in SE Michigan raccoons are a very common nuisance animal. They often enter homes by tearing holes in roofs and siding or by climbing down the chimney. They have babies that can make loud chattering noises and their droppings and urine can contaminate attic insulation. Raccoons are common throughout North America. They are easy to recognize with their black face mask and ringed tail. Their feet are well adapted to climbing and their sense of hearing, smell and touch are well developed. The average raccoon weighs about 10 to 25 pounds. They are mostly active at night though they may be seen at dawn or dusk. Raccoons are omnivores, eating both plant and animal foods. They feed on berries, nuts, acorns, crayfish, frogs, insects, bird eggs and of course, garbage from humans. 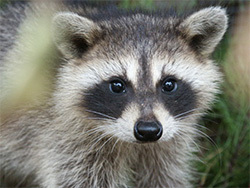 Raccoons breed mainly in February with most litters being born in late March and early April. Females usually have between 3 and 8 babies. Juvenile raccoons are weaned within 2 to 4 months. 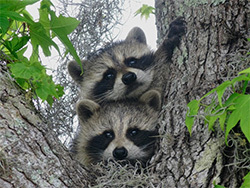 Raccoons can be controlled by trapping, exclusion and repairs. Once the adults have been safely removed, the babies can be located and removed by hand. After all of the animals have been removed the entry point can be repaired and exclusion can be performed to prevent future damage. Common entry points include: attic vents, attic fans, louver vents, soffits, overhangs, chimneys, foundation vents and more. The experts at Animal Pro are capable of performing all types of repairs and exclusion as well as attic clean-ups and re-insulation.